The Yucatan peninsula is situated on the southeast coast of Mexico where white powdery sand beaches and crystal clear turquoise waters beckon to young and old alike. Visitors will find a full range of water sports, plentiful golf courses, Maya-inspired spas, an underwater museum, and some of the best restaurants in Mexico. Also found on Mexico’s tree-covered Yucatan peninsula are several Mayan archeological sites — Chichen Itza, Coba, Edzna, Kabah, Tulum, and Uxmal. We had been invited to attend a Mayan wedding at the Royal Cancun, an all-inclusive adults-only resort. With the prospect of 82 degree weather, I packed my snorkel, sun block, a cream-colored long summer dress (more about this later) and an extra 4 GB memory card for my digital camera. The Mayan culture is said to have had its beginnings on August 11, 3114 BC, the date the Mayan world started marking time via the Mayan Long Count Calendar. The end date of the Mayan calendar, December 21, 2012, has caused much controversy, and as a result all things Mayan are experiencing a renewed interest, especially Mayan weddings. In the time of the ancient Maya, marriages were arranged by a professional atanzahab (matchmaker) in more of a business arrangement than a union of two people in love. As a result, the festivities were less than grand. Moving forward several thousand years, the Mayans have discarded the practice of arranged marriages and focus on traditional spiritual guidelines considered to be a link to the universe. Prior to the ceremony, both the Shaman and the couple perform essential traditional rituals. While the wedding site is cleansed at the four cardinal points by the Shaman with the sacred smoke from the Copal tree and the blowing of the conch shell, the couple participates in the ancient Mayans’ Temazcal (sweat lodge) purification ceremony, signifying new beginnings. SPAzul at the Royal Cancun offers an array of Maya-inspired treatments that friends and family can enjoy in the spirit of purification for the ceremony. A perennial favorite — the one that had me walking on air for several days — is the Chicxulub Clay and Banana Leaf Massage. Healing clay from the Maya crater Chicxulub is massaged into the body, which is then wrapped with steamed banana leaves and sealed with light herbal jojoba oil. The spirit is reconnected with the earth forces as the body is re-mineralized. Mayan music is performed as the couple leaves the Temazcal and leads the procession of guests to the wedding site, where the couple is married inside a circle of friends and family. The wedding party itself is limited to the bride, the groom, and the Shaman. Unity of all the elements is the core of cosmic weddings. The Mayan wedding ritual altar is created to represent the four cardinal points — north with red flowers, south with purple flowers, east with yellow flowers and west with white flowers. Candles are added to each cardinal point to represent the four Mayan cosmos gods: Zac Cimi, guarding the west, Hozanek, guarding the south, Hobnil, guarding the east, and Can Tzicnal, guarding the north. In the center of the altar is a sacred candle to bond the couple to the feminine Mother Earth and the masculine Cosmic Energy. And on the altar there are the traditional offerings of corn, beans, rice, and fruit for the gods. The bride and groom wear simple natural clothing of white or off white, and are barefoot so they can absorb the energy of the ceremony. A Mayan bride traditionally wore a natural cloth skirt and wedding huipil (an elaborate brocaded blouse traditionally sewn by the groom’s mother) and the groom wore an embroidered loincloth decorated with parrot feathers, semiprecious stones and shells. Instead of rings the bride and groom exchange floral crowns during the ceremony to celebrate their union. Wedding guests also wear natural cloth clothing in white or cream, and are preferably barefoot, so they too can share in the spiritual energy created by the ceremony. For the guests at the wedding we attended, many of whom arrived bearing gifts, there was a feast of turkey cornmeal steamed dumplings, beans, potatoes, and tortillas. The wedding included a four-course luncheon, plus wedding cake and open bar. The traditional Mayan wedding does not include designer gowns or tuxedos, diamond rings, five-tier wedding cakes or seven-course dinner receptions with an open bar. There are no limos, bridesmaids, guest books or pre-nuptial agreements. However, in the 21st century the traditional Mayan wedding can be modified, especially when held at an all-inclusive resort. On the Yucatan peninsula, in both Cancun and Playa del Carmen, Real Resorts offers a Traditional Mayan Wedding Package on the beach with a Shaman which is authentic and inspirational. The Shaman and the resort staff can guide you to the perfect balance of ancient and modern elements for your Mayan wedding. After the wedding festivities (and a foray into Club Coco Bongo for an outrageous high-energy, disco-type show replete with confetti cannons and balloons throughout the audience) we returned to our hotel, The Royal in Cancun, for a relaxing soak in the in-room ocean-view double Jacuzzi. The next morning, caramel frappacinos in hand, we were off to visit the archaeological site of Tulum. Built in approximately 1200 AD (early post-classic period), the site is about a one-and-a-half-hour drive south of Cancun on Highway 307. 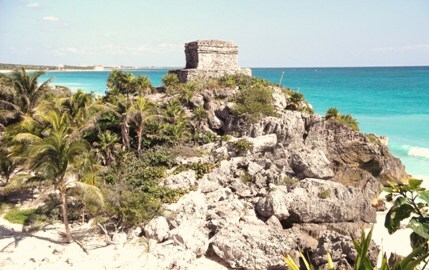 Tulum was central to all other Mayan cities on the Yucatan peninsula. In 1994 access to the site was redesigned so that cars and coaches could no longer park adjacent to the ruins, and a parking lot was built about a 10-minute walk away. A shuttle now provides easy access (for a fee) for those unable or unwilling to take the flat and paved pathway. The visitors’ center at the parking lot houses numerous souvenir shops in addition to refreshment stalls, toilets and telephones. For our last night in Cancun, we stayed at the Royal Playa del Carmen, sister all-inclusive resort property to the Royal Cancun. Playa del Carmen’s claim to fame is that it has blossomed from a sleepy fishing village into a cosmopolitan destination. The expat community continues to grow as more and more visitors return to make their Caribbean dreams a reality. Sherry was both tender and moist with a delicate infusion of marsala, and the Sambuca mousse was light and luscious. Our excursion to the Yucatan peninsula was over far too quickly. I didn’t even get a chance to use my snorkel!